Following Sotheby’s highly successful Hong Kong Fine Jewels & Jadeite Sale held in December 2013, the auction house has announced the holding of the much anticipated event for this year, on Thursday, November 27, 2014 at their Hong Kong Gallery, 5/F One Pacific Place, 88 Queensway, Hong Kong at 2.30 PM HKT. The auction will be preceded by an exhibition of the lots on offer at the same venue from Friday, November 21, 2014 to Wednesday, November 26, 2014, from 10.00 AM to 7.00 PM HKT on each day. 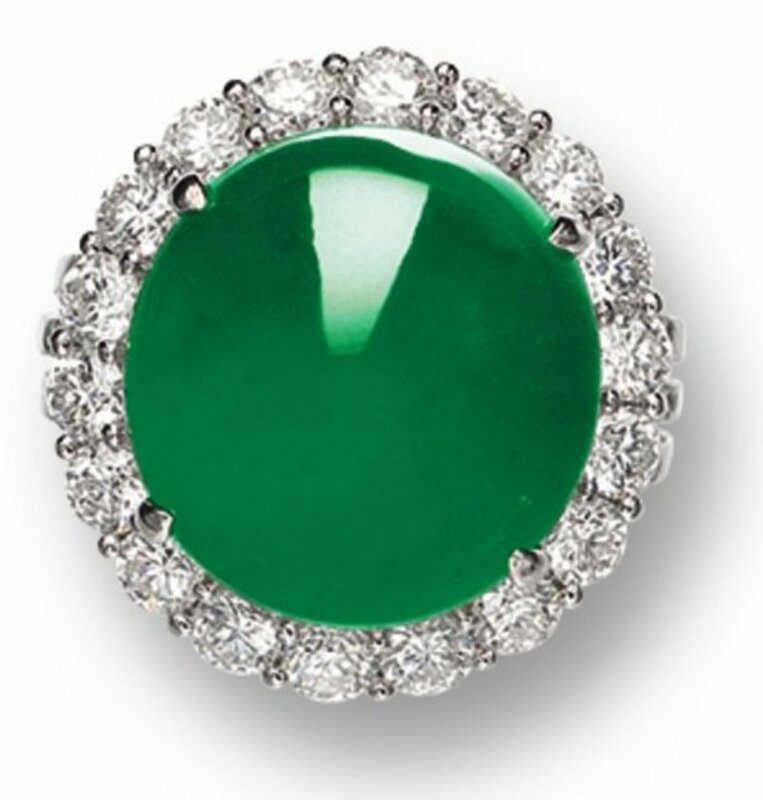 The sale features an exciting array of colored and colorless diamonds, colored gemstones such as jadeite, rubies, sapphires and emeralds, exquisitely designed signed pieces from famous jewelry houses, highlighted by the iconic Cartier “Tiger” Brooch as well as modern and vintage pieces for any occasion, catering to the abilities of a wide range of collectors, with estimates ranging from as low as US$2,500 to as high as US$800,000. In keeping with Sotheby’s CSR initiatives as one of the leading auction houses in the world, the auction also includes a charity session featuring 11 lots of whimsical jewels and watches, the proceeds of which, would go to the Chinese medical charity “Operation Smile China Medical Mission” (OSCMM) that provides free surgery to the underpriviledged children with cleft lips and/or palates in China. Founded in Hong Kong in 1991 OSCMM has changed 26,000 smiles and lives with the generous support of volunteers and donors from all over the world. OSCMM is part of a global alliance of Operation Smile Foundations and Chapters dedicated to healing children’s smiles through surgery, thus forever changing their lives. Sotheby’s Hong Kong by offering an excellent opportunity to acquire jewelry for the festive season invites their clients to join them in contributing to the transformation of these unfortunate children’s lives and be their reason to smile. The second highlight of the sale is Lot 1481 – A Fine Ruby and Diamond Necklace – with a pre-sale estimate of HK$5.0-6.0 million (US$640,000-770,000). The 42 cm. 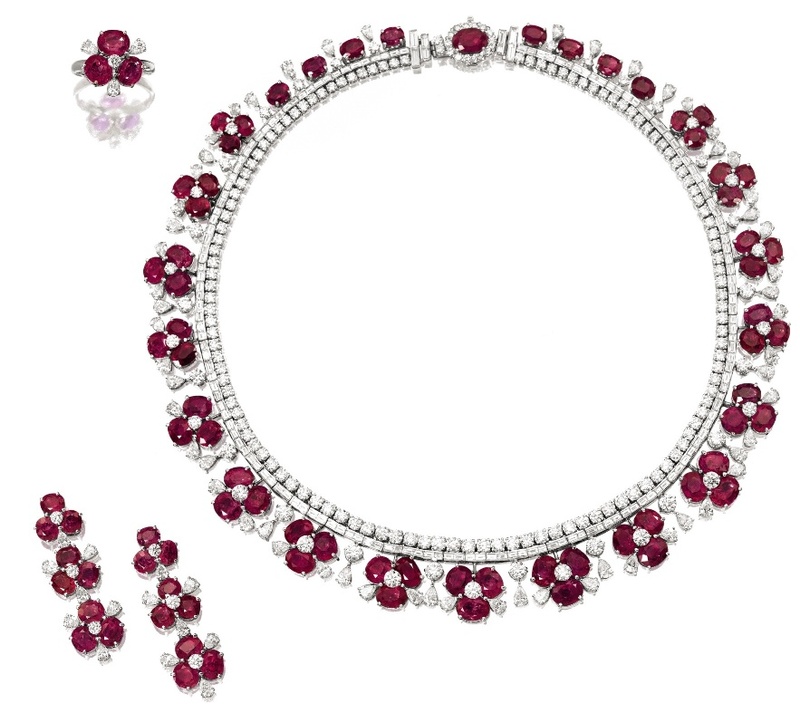 necklace is set with 37 graduated oval-cut rubies with a total weight of 50.57 carats. Each ruby is surrounded by pear-shaped and brilliant-cut white diamonds, with a total weight of 42.70 carats. The rubies and diamonds are mounted in 18k white and yellow gold. Two lab reports by GGL and GRS certify that the rubies are natural and of Burmese origin, with a vivid red (pigeon’s blood) color, with no evidence of thermal treatment. GGL goes a step further and certifies that the rubies originate from the most famed Mogok Valley of Burma. Lot 1412 is another jadeite lot titled Fine Jadeite And Diamond Ring, set with an oval jadeite cabochon of fine translucency and emerald-green color, highlighted by a brilliant-cut diamond surround mounted in 18k pink gold. Hong Kong Jade & Stone Laboratory certifies the natural origin of the jadeite known in the trade as “A Jade.” Estimate HK$1.9-2.2 million (US$240,000-280,000). 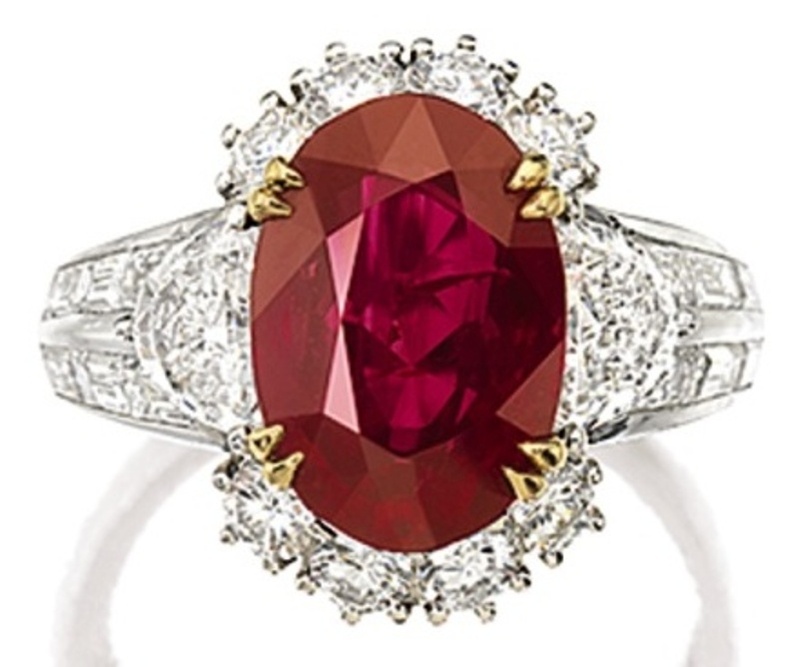 Other significant ruby lots include lots 1470 and 1455. Lot 1470 – A Fine Ruby And Diamond Ring by Cartier – is set with a 4.79-carat oval-cut ruby as center piece, flanked on each shoulder by a half-moon shaped diamond and the sides decorated with brilliant-cut and baguette diamonds, together weighing 1.30 carats, mounted in platinum. GGL certifies that the 4.79-carat ruby is natural and of Burmese origin from the famed Mogok Valley, with no indications of heating, and the vivid red color is called “pigeon’s blood” red color in the trade. Estimate HK$2.2-2.8 million (US$280,000-360,000). Lot 1455 – A Ruby And Diamond Demi-Parure – consists of a necklace, a pair of matching pendant earrings and a matching ring, all set with rubies and diamonds. The three-layered, 40 cm necklace has two inner layers of baguette-cut and square-cut diamonds. The outer layer is composed of 17 floral links in the front, each set with a central brilliant-cut diamond, 3 oval-cut/ cushion-cut rubies and two pear-shaped diamonds. In between two florets is a circular-cut and pear-shaped diamond. There are 51 rubies in the 17 florets in front. 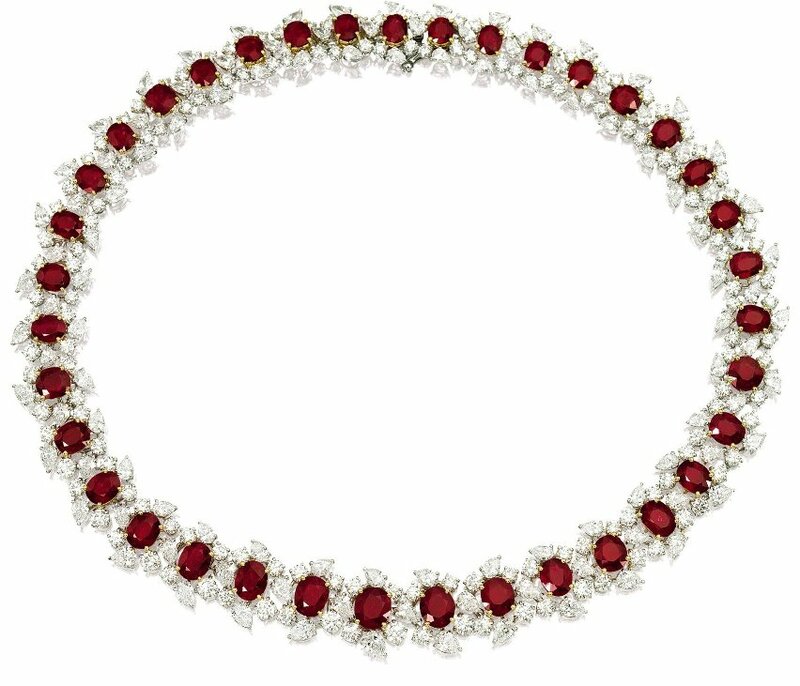 In the rear of the necklace instead of florets, single cushion-shaped rubies are set, four on each side of the clasp, making 59 rubies. The clasp is set with a single oval-shaped ruby surrounded by circular-cut diamonds. Hence there are 60 rubies in the necklace. The matching pair of pendant earrings is made of three florets each. Each floret is set with three oval or cushion-shaped rubies, a central circular-cut diamond, and three pear-shaped diamonds alternating with the rubies. There are 9 rubies in each pendant earring making 18 rubies for the pair. The ring is set with a singe matching floret, set with three oval/cushion shaped rubies, a central circular-cut diamond and three pear-shaped diamonds alternating with the rubies. The total weight of the rubies is 117.95 carats and that of the diamonds 39.00 carats. Three GRS reports certify the natural Burmese origin of the rubies with no indications of heating. Estimate HK$1.6-1.8 million (US$206,000-230,000). 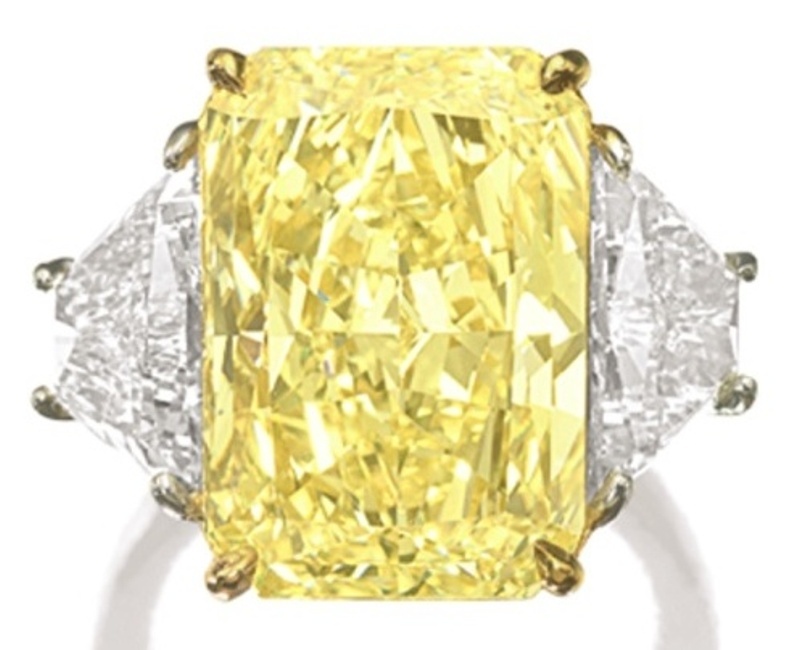 Top lots among colored diamonds are lots 1479, 1385 and 1386. Lot 1479 – A Fine Yellow Diamond And Diamond Necklace – is a 41 cm. 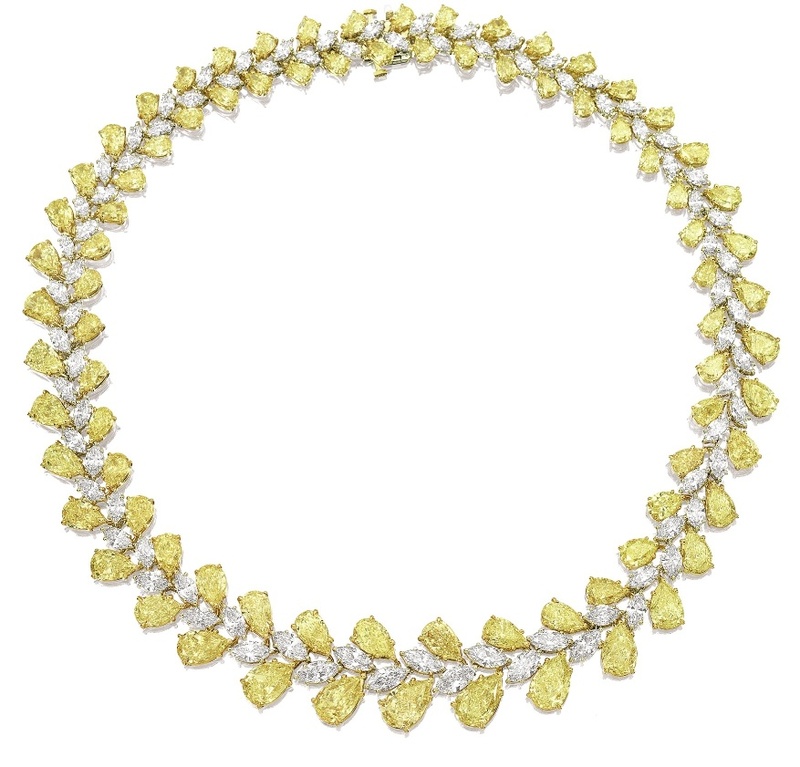 necklace set in two rows with 82 pear-shaped, fancy intense yellow and fancy yellow diamonds with a total weight of 70 carats, and 82 marquise-shaped colorless diamonds also in two rows with a total weight of 25.20 carats, mounted in platinum. Fifty-five yellow diamonds in the necklace weighing between 0.42 to 3.14 carats are certified by GIA as natural fancy yellow to fancy intense yellow diamonds, with clarity grade from SI2 to Internally Flawless. Estimate HK$3.5-4.2 million (US$451,000-541,000). Lot 1385 – Fine Fancy Intense Yellow Diamond And Diamond Ring – The centerpiece of the ring is a 13.88-carat, cut-cornered rectangular modified brilliant-cut, VS1-clarity, fancy intense yellow diamond, which is flanked on either side by a trapeze-shaped colorless diamond, together weighing 3.00 carats, mounted in platinum and 18k yellow-gold. GIA certifies that the 13.88-carat, cut-cornered rectangular modified brilliant-cut diamond is natural fancy intense yellow, VS1-clarity. Estimate HK$3.0-3.6 million (US$386,000-464,000). Lot 1386 – Pair of Fancy Intense Yellow Diamond And Diamond Ear Clips – Each clip suspends a cut-cornered rectangular modified brilliant-cut fancy intense yellow diamond weighing 6.30 and 6.15 carats respectively, with a trefoil surmount set with three pear-shaped diamonds and a circular brilliant-cut diamond in between. Total weight of eight colorless diamonds 4.45 carats. 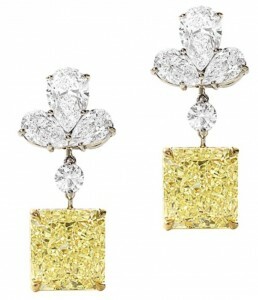 Diamonds mounted in platinum and 18 karat yellow gold. Estimate – HK$2.00-2.40 million (US$257,000-309,000). The Sapphire lots are led by Lot 1457 – A Sapphire And Diamond Ring – The centerpiece of this cluster ring is a 12.10-carat, oval-cut, natural Burma blue sapphire, highlighted by a pear-shaped colorless diamond surround with a total weight of 5.35 carats, mounted in 18k white gold. GGL certifies the natural Burma origin of the sapphire with no indications of heating. Estimate HK$1.5-1.8 million (US$193,000-232,000). 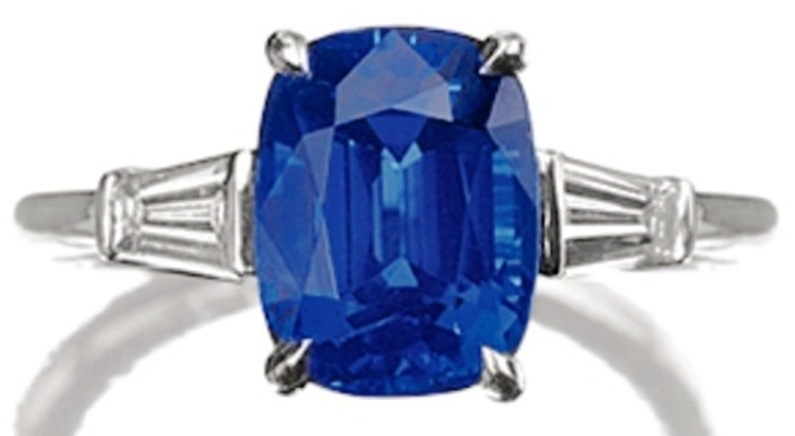 Other sapphire lots include Lot 1453 and Lot 1433. 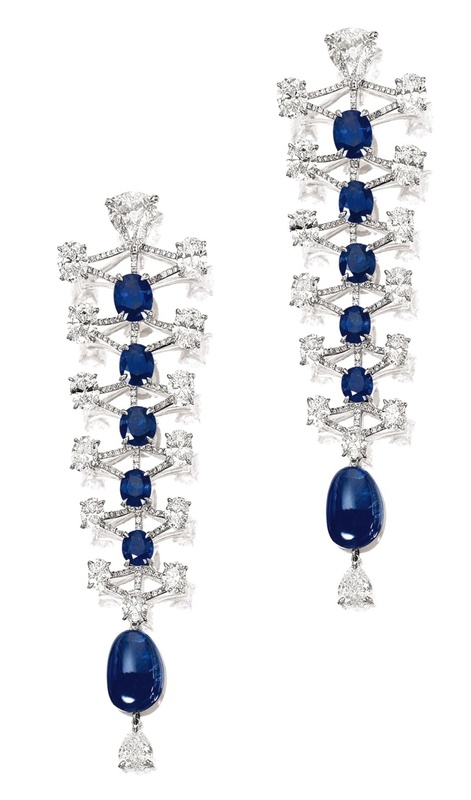 Lot 1453 – A Pair of Sapphire And Diamond Pendant Earrings – Each pendant earring is designed as a semi-flexible framework made of six graduated rhomboidal frames placed end-to-end vertically, with the largest frame at the top and the smallest at the bottom. Five graduated oval-shaped blue sapphires are mounted on the framework, each at the point where two rhomboidal frames meet, the sapphires also decreasing in size from top to bottom. At the bottom of the white-gold framework a large oval-shaped blue sapphire bead is placed anchored by a pear-shaped diamond. Another pear-shaped diamond at the top of the framework covers the suspension of the pendant earrings. Six pairs of graduated oval-cut diamonds are placed at the vertices of each each rhomboid, the size of the diamonds decreasing from top to bottom. Total weight of the sapphires and diamonds are 26.52 carats and 19.60 carats respectively. SSEF certifies that the sapphires are of Burma origin with no indications of heating. Estimate – HK$800,000-950,000 (US$103,000-122,000). Lot 1433 – Sapphire and Diamond Ring by Tiffany & Co. 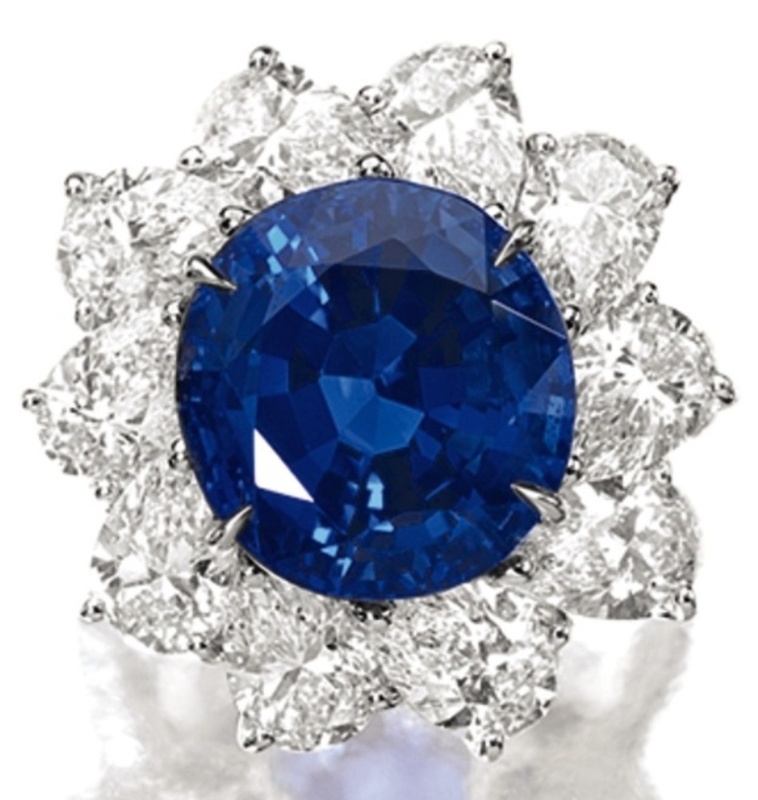 Lot 1433 is a signed jewel titled “Sapphire And Diamond Ring by Tiffany & Co.” The centerpiece of this ring is a 4.20-carat, cushion-shaped Burma blue sapphire, flanked on each side by tapered baguette diamonds, mounted in platinum and signed and numbered S01599. AGL and GGL certify that the 4.20-carat blue sapphire is of Burmese origin with no evidence of heat enhancement. Estimate – HK$220,000-260,000 (US$28,000-33,000). Emeralds are led by Lot 1469 – A Fine Emerald And Diamond Ring – with an estimate of HK$1.5-1.8 million (US$193,000-232,000). 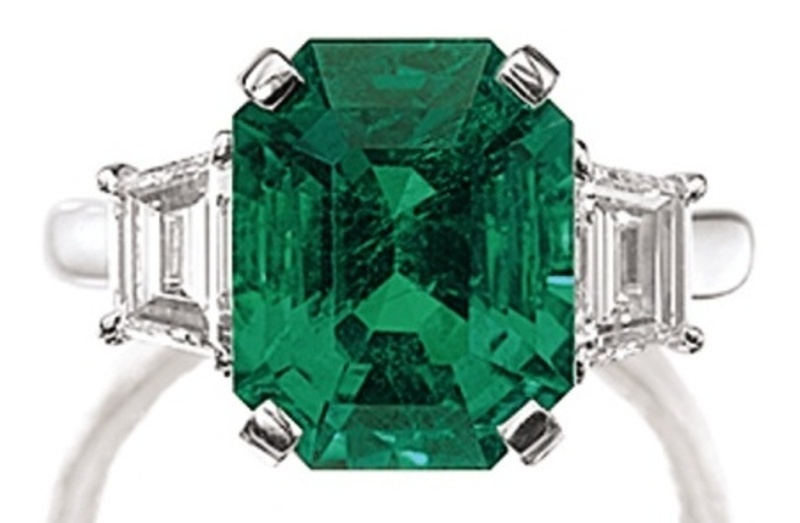 The centerpiece of this ring is a step-cut emerald weighing 4.81 carats, flanked by two trapeze-shaped diamonds, mounted in patinum. SSEF and GGL certify that the 4.81-carat emerald is natural and of Colombian origin with no indication of clarity modification. 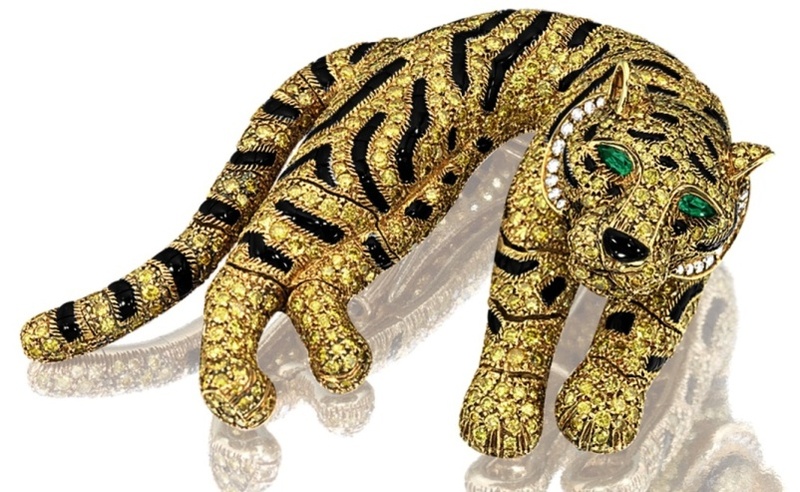 The collection of signed jewels featuring at the auctions will be highlighted by the iconic Cartier “Tiger” brooch with the same design features as the original “Great Cat Jewels” collection inspired by Cartier’s director of haute joaillerie Jeanne Toussaint. Woolworth heiress Barbara Hutton commissioned Cartier to create a three-dimensional Tiger clip brooch set with yellow diamonds and striped with onyx . The Tiger clip brooch entered the jewelry collection of the stylish icon and trend-setter, one of the most impressive jewelry collections of all time. The Tiger clip brooch featuring at the auction, Lot 1480 – A Charming Yellow Diamond, Diamond, Onyx And Emerald Tiger Clip Brooch- by Cartier – the property of a gentleman, is a later version similar to the famous Barbara Hutton tiger brooch, with same design features and craftsmanship as the original version. The tiger crafted in 18k yellow-gold, has legs and tail articulated to move with the body, the tail hanging majestically out, the body in a composed curl, with piercing emerald eyes. The body of the tiger is set with brilliant-cut yellow diamonds and white diamonds and fancy shaped onyxes forming the black stripes and the eyes set with pear-shaped emeralds. Estimate – HK$1.2-1.6 million (US$154,000-206,000).